In this work we combine tight-binding calculations of the two-photon transition probability with sophisticated ab-initio real-time Bethe-Salpeter simulations of the two-photon resonance third-order susceptibility. 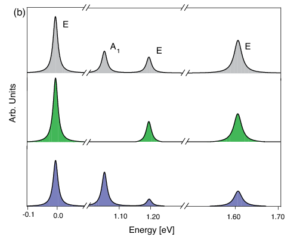 This combination is a unique feature of this work: on the one hand the tight-binding calculations allow us to identify the symmetry properties of the excitons, on the other hand the ab-initio real-time Bethe-Salpeter simulations provide the TPA spectra—to our knowledge the first ab-initio TPA spectra at this level of theory—which can be compared quantitatively with experiment. These two very different approaches show consistently that the TPA is able to probe the lowest 1s exciton in the bulk and single layer hexagonal crystal.